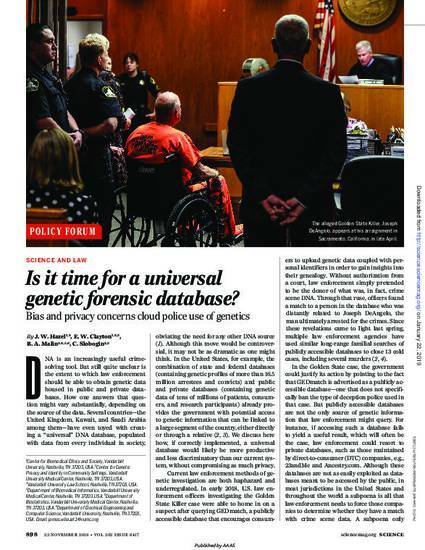 Is It Time for a Universal Genetic Forensic Database? The ethical objections to mandating forensic profiling of newborns and/or compelling every citizen or visitor to submit to a buccal swab or to spit in a cup when they have done nothing wrong are not trivial. But newborns are already subject to compulsory medical screening, and people coming from foreign countries to the United States already submit to fingerprinting. It is also worth noting that concerns about coercion or invasions of privacy did not give pause to legislatures (or, for that matter, even the European Court) when authorizing compelled DNA sampling from arrestees, who should not forfeit genetic privacy interests simply by virtue of being arrested.